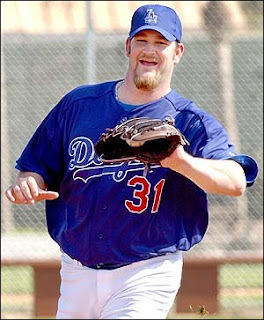 Dodgers porker Brad Penny, the guy who wears Hurley gear during post-game interviews (when he was good enough to warrant an interview) despite being from the number one hick state in the union (Oklahoma), made his much anticipated (by the Padres) return to the mound tonight. The at least 260 pound Penny met and surpassed all expectations. He walked his first batter then gave up two singles, and was disqualified by Joe Torre before he could record an out. The final batter to single off Penny, whose name matters not, is a September call-up despite hitting .215 in AAA. Vin Scully found this curious and amusing.